to control livestock, pets, and wildlife. FAST FENCE Electric Nets are available in six styles and three colors to serve most every electric fencing need on small farms, country estates, and rural properties everywhere. 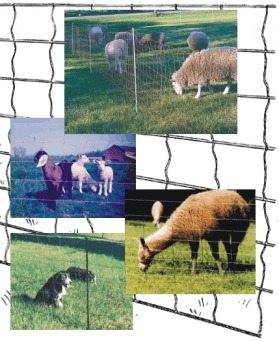 Standard Mesh Nets - traditional 4" x 6" orange mesh for sheep fence, goat fence, dog pens, etc, in 34" or 42" heights. Countryside Nets have green standard mesh and black posts. Fine Mesh Nets - tighter 3" mesh electric netting for lambs, kid goats, chickens, ducks, & other poultry, and wildlife like rabbits, foxes, coyotes, raccoons, deer, etc., available in 44" orange or green nets and in 34" green nets. Specialty Nets - there are two special black and white electric net designs, Dry Country 42 that can have alternating polarity wires, and Universal 42 black and white Combo Mesh nets with two additional lower strands for improved small animal control. Testimonial: Courtesy of Judith Sanders, Sheep Wrecked Farm, Deerfield, OH. "I've never had an animal get through or over the electric netting in over ten years of use with FAST FENCE nets."